It’s a great pleasure to introduce Columbia Institute of Pharmacy, which is synonymous to ultimate in Pharmacy education in the state of Chhattisgarh. Columbia Institute of Pharmacy, Raipur is run & managed by Janpragati Education Society (JPES), Raipur. The society was founded in the year 2003 under the chairmanship of Mr. Kishore Jadwani & Secretary, Mr. Harjeet Singh Hura. There was vision to become one of the best Institutes that should be recognized far and wide for excellence in teaching, research and public service. Chairman and secretary of the society, both are graduates in Pharmacy from Sagar University, Madhya Pradesh. In the year 2004, the society started Columbia College of Pharmacy to conduct Diploma in Pharmacy course in a rented building at Raipur which was then shifted to the present location in 2005. In the year 2006, the society laid down the stone of Columbia Institute of Pharmacy to conduct B. Pharmacy course. It is the intensions and visionary mindset of the society members that within a span of just six years i.e. by 2010, the society come up with Columbia Group of Institution with a campus of about 25 acres of land and more than 4 Lakh sq. ft. of construction area, and the expansion and diversification is still in progress. At present, Columbia Group of Institution conducts B.E., MBA, B.Ed., and B. Nursing courses apart from pharmacy. All the courses are affiliated by Govt. Universities and Professional bodies of India. The Institute of Pharmacy is located in Village Tekari, near Vidhan Sabha, Raipur. The goal of the Institute is not only to excel in the field of education but also to conduct social and charitable outreach programme. 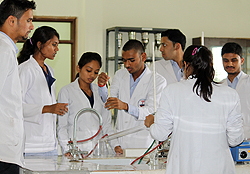 At present, courses conducts by Columbia Institute of Pharmacy are B. Pharm., M. Pharm., and PhD. The institute seeks to bridge the ever-widening gap between modern pharmaceuticals and traditional drug system. Towards this, our Institute frequently conducts various Workshops, seminars & faculty development programmes. The Institute has also bagged research grants from various state & central organization such as CCOST, AICTE, DBT, DST and ICMR.